Why do awkward silences feel so long and well, awkward and silent? We’ve all got those people at work with whom we struggle to strike up a conversation. Whilst we can’t expect,or even want to be, best buddies with everyone, getting to know people better can have real benefits. 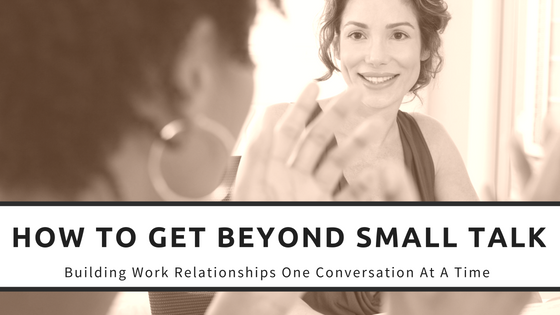 To do that, you need to get beyond small talk. For those of you who are getting a bit squirmy that things may be getting too personal for the workplace. Just bear with me. Getting to know people a little better is all about trust. Can you really trust someone that you don’t know anything about? And this is a two way street, think how you could benefit at work if people trusted you more. Nick Cowley and Nigel Purse in their book, 5 conversations: How to Transform Trust, Engagement and Performance at Work, believe that getting to know people better is the foundation of trust. ‘When trust exists in a relationship we are open to ideas, possibilities and collaboration. When trust is absent we are closed, defensive and suspicious’. And why does trust matter so much? They go on to say…. So it’s time to get past the small talk. Are you ready? You arrive early for a meeting and your heart sinks a little when you see Dave is the only other person there. It’s not that you dislike Dave, he’s just not the easiest person to kill time with. Silence. Nowhere to go from here. AAAAAH awkward. Time for you both to look at your phone and pretend you have an important email to respond to. Suddenly, there’s potential to open up the conversation. You could prompt stories of abseiling or volunteering for a cause close to their heart. Or a passion for photography or travel. It may even be as simple (and normal!) as Netflix and meals out with friends. Can you see how this will give you bigger insight? Think about your follow up question. Ah not so great. Unless you have an affinity with Reigate, you may have found yourself in a conversational dead end again. Vanessa Van Edwards, in her fantastic book ‘Captivate. The Science of Succeeding With People’, talks about The Similarity-Attraction Effect. Basically we like people who like the same things to us. So try and find a similarity. You may not enjoy abseiling, but you may do other outdoor adventure sports? Your goal in this conversation is to find something in common. It may be tenuous but it will be something to build on. Try and keep your response positive. Obviously, don’t pretend you like everything he mentions (that’s lining you up for untold awkwardness in the future). But don’t shut the conversation down. ‘Rock climbing! Not for me! I’m terrified of heights’ There’s that dead end again. Vanessa Van Edwards refers to this as ‘handicapping the connection’. Do you remember at parties as kids when you’d all run around the room tapping the balloon upwards, trying not to let it drop to the floor? Think of a conversations just like that. How can you keep it moving? Don’t be the kid that stamps on it and ruins all the fun. Don’t forget to share something about yourself too. Every two or three questions, share some information about yourself. Trust is a two way thing. They need to get to know you a little better too. To keep the conversation flowing, end your contribution with a question to bring them back into the conversation. You: ‘Great. What triggered your interest in Vintage cars? Even if your first attempt is a little uncomfortable, don’t give up after the first vague answer. They are probably surprised that you asked. Next time they will be ready for you and you’ll learn that they’re a drummer in a local rock band (who knew!) or had auditioned for the Great British Bake Off. After the second attempt, if they really don’t want to share, that’s fine too. Giving them a little insight into your life (no long monologues please!) may just start the process. They may even be the one asking you questions next time around. If you’re struggling to get beyond small talk and build stronger relationships at work, you may like this programme which is designed to make that easier. Team Review: What did you learn this year?